This week I discussed tips to get ready for Christmas with a cocktail recipe, oyster hints and party tips with Trish Magwood of the Food Network's partydish show. Chris Field was the oyster shucker, he works at Bearfoot Bistro in Whistler, www.bearfootbistro.com. I featured the Rosemary Swizzle, a cocktail made using Crabapple Wine from Elephant Island Orchard Wines in Naramata. Check their website to find out where they are sold. Some stores have recipe cards for the Crabapple Wine and their Apricot Wine as well. White truffles from Alba are HOT this time of year. They cost over six thousand dollars a kilo! High-end Vancouver restaurants like Bis Moreno and Cin Cin are offering truffle dinners and menus, give them a call if you're interested in these once-a-year opportunities to sample fresh white truffles. 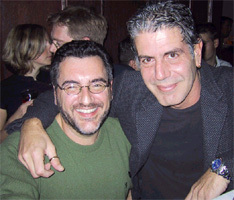 This week I interviewed Anthony Bourdain of Kitchen Confidential and A Cook's Tour fame. 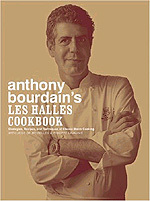 He has a new cookbook, Anthony Bourdain's Les Halles Cookbook; Strategies, Recipes and Techniques of Classic Bistro Cooking. To win a copy of the book, visit my blog and tell me about your most perfect meal. Anthony Bourdain's TV show, A Cook's Tour will air on Saturdays at 11 p.m. ET/8 p.m. PT on Food Network Canada. This week I spoke with Chris Johns, the journalist who wrote En Route magazine's Best New Restaurants of 2004 feature. It's in the November issue, which you can view on line at www.enroutemag.com.